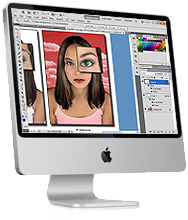 Photoshop CC | Level 1 teaches you to how use layers, retouch photos, manipulate images, create selections, create composites, manage your workspace, add text, layer effects, masks, filters, optimizing for the web, & more. Let's Get creative! Photoshop CC: Level 1 is for beginners who need an essential understanding of photo editing or want to learn what you can do with this fun graphics application!